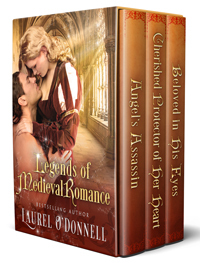 For this week’s Medieval Romance Monday, we are featuring Legends of Medieval Romance: The Complete Angel’s Assassin Trilogy by Laurel O’Donnell. The honored LADY of Acquitaine prepares for her upcoming marriage. Her BETROTHED battles the unwanted visitors that have come for more than just celebration. Will his past catch up to him and ruin all he has fought so hard to protect? As captain of the guard, GAWYN serves his brother, Lord Damien, faithfully and loyally; there is nothing he would not do for him. JUSTINA AUBER must protect her younger brother from the assassin who murdered her father. Will Gawyn betray his brother to save the woman he is falling in love with? Get Legends of Medieval Romance on Amazon today! This entry was posted in Medieval Romance Monday and tagged laurel o'donnell, medieval romance boxed set. Bookmark the permalink.